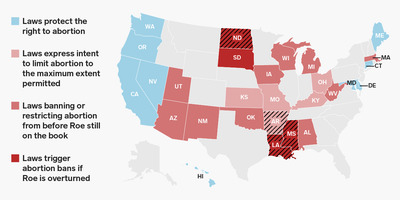 Samantha Lee/Business InsiderThis map shows what abortion policies states would enact if Roe v. Wade were overturned. The landmark Supreme Court case Roe v. Wade and subsequent rulings upholding it have granted Americans the right to abortion since 1973, but the reality of that right varies dramatically from state to state. Since Roe became the law of the land, individual states have found dozens of ways to make it as difficult as possible for patients to actually access the procedure. From strict regulations on clinics and bans on abortion after a certain number of weeks, to requiring patients to receive counseling and undergo waiting periods, these laws have tested the limits of Roe – with some ending up in federal court. If President Donald Trump’s nominee Brett Kavanaugh is confirmed, the Supreme Court will have a solidly conservative majority, causing many abortion rights advocates to fear that such a makeup would overturn Roe altogether. The more likely scenario, according to legal experts, is for the high court to chip away at abortion rights by ruling in favour of the state-level restrictions that reach their . These seven charts and maps illustrate what abortion access in America actually looks like today, and what could happen if Roe fell. In the decades since Roe, individual states have enacted a slew of restrictions to make it as difficult as possible for abortion clinics to operate. Targeted Restrictions on Abortion Providers, or TRAP laws, impose very specific regulations on clinics. Oftentimes, these restrictions are so expensive that the costs of implementing them cause many clinics to close down altogether. These include requirements on the width of corridors, the size and equipment of procedure rooms, and mandating that clinics have admission privileges at local hospitals, even though less than 0.5% of abortions result in complications. 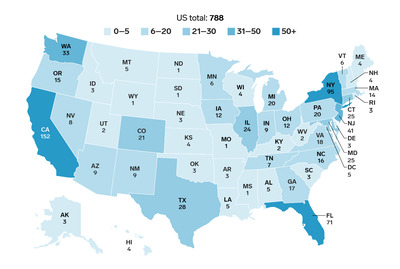 Research has tracked the number of abortion clinics dropping after states have passed TRAP laws. Five states now have just one remaining abortion clinic. The Supreme Court struck down one of the most extreme TRAP laws, Texas’ HB2, in a 5-3 vote in 2016. But despite that, over 20 states still have such laws on their books. A closer look at the county level shows stark disparities in abortion access across the country. There are now 16 states where 95% of counties do not have an abortion clinic. According to a 2017 study from the Guttmacher Institute, one in 5 American women have to travel at least 43 miles to reach their closest abortion provider. Between 2011 and 2014, the distance required to reach a clinic increased in seven states. Researchers found notable increases in distance to a clinic in Missouri and Texas, states that had introduced TRAP laws. “Increased travel distance means increased costs for transport, overnight stay, lost wages from time off work, and childcare,” wrote Dr. Ushma Upadhyay, a professor of obstetrics and gynecology at the University of California in the Lancent Journal of Public Health. In the past several years, states have made many attempts to restrict patients from getting abortions after a certain number of weeks – oftentimes before a woman even knows she’s pregnant. In December 2016, the Ohio state legislature passed a “heartbeat bill” that would have banned abortions after six weeks, or when a fetal heartbeat can be detected, even though many women don’t know they’re pregnant until after that point. Gov. John Kasich vetoed the bill and signed a 20-week ban into law on the same day. Other states have tried to ban dilation & evacuation (D&E), the method commonly used to perform abortions after 14 weeks. The surgical procedure is usually used in late-term miscarriages and abortions to remove the fetal tissue as safely as possible. They account for less than 0.5% of all abortions. Prohibiting D&E abortions is effectively a ban on all second-trimester abortions, landing such bans in murky legal territory. 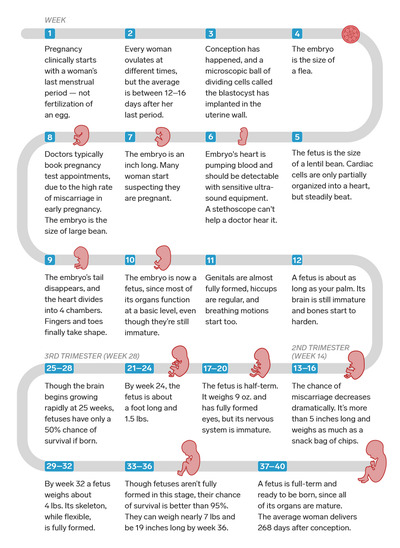 In Roe v. Wade, the Supreme Court didn’t specify when abortions were legal, deciding at the time to vaguely make it unconstitutional to outlaw them up until the foetus was “viable,” since the science hadn’t (and still hasn’t) determined at the time when that was, medically speaking. Texas and Alabama’s D&E bans have reached federal appeals courts, and the Supreme Court could hear them in the upcoming term. While the last decade has seen an explosion in abortion restrictions, Americans as a whole haven’t become more anti-abortion in the past 20 years. Currently, 58% of adults say abortion should be legal in all or most cases, while 40% say it should be illegal in all or most cases. Those numbers are almost exactly the same as they were back in 1995. Support for abortion has long been a partisan issue, with support for abortion in all or most cases being highest among liberal Democrats and lowest among conservative Republicans. 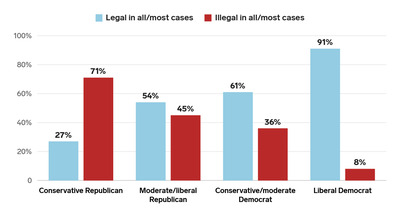 But over a quarter of those who identify as conservative Republicans now believe abortion should be legal in all or most cases. Despite the partisan divides, bipartisan support for Roe v. Wade is at a new high. A Wall Street Journal/NBC News poll released July 23 found that 71% of Americans and 52% of Republicans polled believed that Roe v. Wade should not be overturned. If the Supreme Court does overturn Roe, the issue of abortion will go back to the states. Elizabeth Nash, a senior state issues manager at the Guttmacher Institute, explained all the possible outcomes to Business Insider. Four states passed “trigger laws” after Roe was decided, which would automatically make abortion illegal as soon as the decision is overturned. But 10 states have pre-Roe abortion bans or restrictions still on their books that are currently un-enforceable because they violate Roe. Unlike trigger laws, Nash explained, these bans wouldn’t go back into effect immediately. A government actor like an attorney general or a legislature would have to put them back in place. Seven states have passed decrees that are “without the force of law” expressing their intent to limit abortion to the greatest extent permitted by federal law if Roe falls, Nash said. On the flipside, nine states have laws on the books that ensure abortion stays legal within their borders.